What is the difference between speed, velocity and acceleration? An electromagnetic wave as the name suggests is both an electric and magnetic wave. An electromagnetic wave consists of an electric field and a magnetic field at right angles to each other and to the direction of the motion of the wave. Because the electric and magnetic fields are at right angles to the direction of the wave, the electromagnetic wave is a transverse wave. Electromagnetic radiation is classified into types according to the frequency of the wave: these types include, in order of increasing frequency, radio waves, microwaves, terahertz radiation, infrared radiation, visible light, ultraviolet radiation, X-rays and gamma rays. Unlike other waves, electromagnetic waves to not carry energy by causing matter to vibrate. It is the electric and magnetic fields that vibrate. This is the reason why electromagnetic waves can travel in a vacuum where there is no matter. Is light a particle or wave? Light has both wave and particle properties. This is also the case for all matter. Electromagnetic radiation can be considered to consist of particle-like packets of wave-energy called photons. These massless particles travel at the speed of light (300,000 kilometers per second in a vacuum). Every photon is characterized by wavelength (the distance from the crest of one wave to the crest of the next wave), by frequency (the number of wave cycles that pass by in a given period, measured in Hertz, which stands for cycles per second), and by the energy it carries (measured in electron volts). What is the relationship between wavelength, frequency and energy of Electromagnetic Radiation? The Planck constant (denoted h), also called Planck's constant, is a physical constant reflecting the sizes of quanta in quantum mechanics. It is named after Max Planck, one of the founders of quantum theory. The Planck constant was first described as the proportionality constant between the energy (E) of a photon and the frequency of its associated electromagnetic wave (v). This relation between the energy and frequency is called the Planck relation or the Planck–Einstein equation. The higher the frequency of light, the higher its energy. Higher frequencies mean shorter wavelengths. We can also say that E = h c / lambda (lamda is the wavelength). High frequency light has short wavelengths and high energy. X-rays or gamma-rays are examples of this. Radio waves are examples of light with a long wavelength, low frequency, and low energy. How are electromagnetic waves produced? Electrons are charged particles that can produce both an electric and magnetic field. In order for electrons however to produce electric or magnetic fields they must be in motion. A charged particle such as an electron that moves back and forth creates both electric and magnetic fields. The source of all electromagnetic waves is charge that is changing speed or direction. When a ground state electron is excited it absorbs a photon. The energy of the photon is equal to the energy needed to maintain the electron at the higher orbital. When the electron returns to the ground state it will emit the photon. The electromagnetic spectrum is a continuum of all electromagnetic waves arranged according to frequency and wavelength. The sun, earth, and other bodies radiate electromagnetic energy of varying wavelengths. Image courtesy of NASA. The visible spectrum is the portion of the electromagnetic spectrum that is visible to (can be detected by) the human eye. Electromagnetic radiation in this range of wavelengths is called visible light or simply light. What are the different types of Electromagnetic Waves? Radio Waves -- The waves in the electromagnetic spectrum that have the longest wavelengths and lowest frequency are called radio waves. Radio waves are used to transmit information from the antenna of a broadcasting station to the antenna of your radio or TV. In astronomy radio waves are used to gain information from distant stars using radio telescopes. Radio telescopes have the advantage that radio waves are not blocked by conditions of the Earth's atmosphere as light waves are. Microwaves -- are the highest frequency of radiowaves. Their wavelength is only a few centimeters long. While microwaves pass right through some materials they absorbed by others. Water and some other molecules found in food absorb microwaves and turn the energy into heat. This is what makes a microwave oven work. Glass and plastic do not absorb microwaves so do not heat up. Metal however does absorb microwaves and that is why we can't put it inside a microwave oven. Short wavelength microwaves are used in radar devices. Radar works by sending out short pulses of radio waves and recording the time it takes for the reflected wave to be picked up by the receiver. 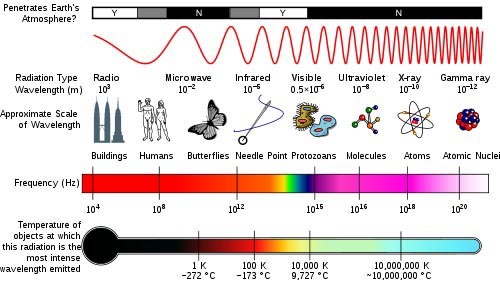 Infrared ---lies between the visible and microwave portions of the electromagnetic spectrum. Shorter, near infrared waves are not hot at all - in fact you cannot even feel them. These shorter wavelengths are the ones used by your TV's remote control. Far infrared waves we experience every day in the form of heat. The heat that we feel from sunlight, a fire, a radiator or a warm sidewalk is infrared. Visible-- waves are the only electromagnetic waves we can see. We see these waves as the colors of the rainbow. Each color has a different wavelength. Red has the longest wavelength and violet has the shortest wavelength. When all the waves are seen together, they make white light. Ultraviolet (UV) light-- is electromagnetic radiation with a wavelength shorter than that of visible light, but longer than X-rays, in the range 10 nm to 400 . Though these waves are invisible to the human eye, some insects, like bumblebees, can see them. It is ultraviolet waves that are responsible for causing our sunburns. UV light cannot pass through glass unless it is made of quartz. X- Rays -- have smaller wavelengths and therefore higher energy than ultraviolet waves. We usually talk about X-rays in terms of their energy rather than wavelength. X-rays are most known for their use in medicine. Because your bones and teeth are dense and absorb more X-rays then your skin does, images of your bones or teeth are left on the X-ray film while your skin appears transparent. Gamma Rays -- have the smallest wavelengths and the most energy of any other wave in the electromagnetic spectrum. These waves are generated by radioactive atoms and in nuclear explosions. Gamma-rays can kill living cells, a fact which medicine uses to its advantage, using gamma-rays to kill cancerous cells. 1. Which color light has the longest wavelength? 2. Which is true about the properties of light? b) a photon more than the energy needed to maintain the electron at the higher orbital must be absorbed. c) a photon equal to the energy needed to maintain the electron at the higher orbital must be absorbed. d) a photon less than the energy needed to maintain the electron at the higher orbital must be absorbed. 4. What type of radiation will most likely be released from radioactive material. 5. Why can you can feel the warmth of the sun through a window but won't get a tan from the Sun? What is the difference between longitudinal and transverse waves: This page contains videos explaining the different waves including Rayleigh Waves and Love Waves. The Electromagnetic Spectrum- Is light a particle or wave? What is the relationship between wavelength, frequency and energy of Electromagnetic Radiation?What are the different types of Electromagnetic Waves? Seismic Waves and the Layers of the Earth: What is a vector quantity? Examples of Vectors. What is a Scalar Quantity? Examples of Scalars. Test your understanding of vectors and scalars.